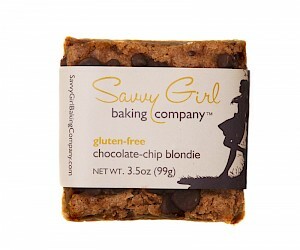 Gluten-Free Chocolate-Chip BLONDIE is a HIT! Wow! This recipe is fantastic and delicious. There is no way you are not going to love this. And gluten-free on top of that! But it is very very indulgent. The serving size is just one-third of this piece - but i doubt anyone can just eat one-third. So the nutritionals I'll share are based on the entire piece. Calories 420, 24 grams of fat, 360 mg of sodium, 39 grams of sugars and 3 grams of protein. So, when you do eat one, DO NOT eat with ice cream! Again I'll say it - delicious - but not for an everyday snack.